Plastic badge holders are an economical and dependable choice for displaying your vertical ID badge. The hard, plastic frame protects your badge and prevents everyday wear and tear, so you can save on reprints. Have been using these card holders for the past two years. They do a good job of protecting the ID card and holding it in the cardholder so it doesn't fall out. Our electronic readers can read through the card holder so the ID does not have to be continually removed. I was afraid the ID badge would slip out, but this is designed to hold a badge tightly and has a cut out so that you can remove it easily if needed. Use the Hard Card Badge Holder to hold our Prox I.D. Badge, Industrial Vehicle Operators License, and Quick Reference Emergency Response Card. We issue new IDS to 400 students, 150 employees, and several visitors and parents each year, with a hard card badge holder. Most we use with a clip to be worn and visible. Our IDS are credit card like in size and thickness. The holder extends the life of the ID card, and proximity and bar code scanners can be used while card is in the holder. Our employees can be rough on their RFID badge cards. To keep costs down (due to frequently replacing their badges) I ordered these hard badge holders. The badges read fine through the holders and they don't get bent or broken. We are using the badge holders for our signature cards and they work great. Great badge protector. Keeps badges from being cracked or bent. Wish the corners were a lttle more rounded. The badge holder is perfect. Looked all over for these hard shell badge holders, finally found them. Great price too! Thank you! These card holders are great, unless highly used. They evenually will not hold the cards and the ID cards drop out. We use these to extend our membership card usage. The kids can easily remove the card if they need to in order to scan in. Overall I think its a great product and I would recommend it. Great for protecting badges from damages and everyday wear. We use this badge holder for our door access cards/ID badges made from the very thin PVC cardstock. Many of our employees wear their cards/badges on lanyards and they hang at desk level when sitting down. The holder protects the card/badge and keeps it from bending. The door access reader has no problem reading the cards in the holder. We'll defintely be ordering them again. ADT cards are fragile. This holder keeps them from breaking in half. Feedback from users: A little heavy and wish it were a bit thinner. The product is great, it preserves badges from getting scratched. I would definitely order them here again when we run out. These badge holders are great. I've replaced hundreds of badges due to them bending, but not anymore. They are going to save the company a lot of money. You can't go wrong with the price either. Sorry, this did not meet our needs. We needed something that could hold 2 cards and this was too "hard" to accomodate this. I don't think it's the products fault, just not what we needed. Returned the product. Everyone at our company likes this badge holder becuase others are too flimsy allowing the id badge to bend and eventually crack. I have only used these for a few weeks but staff seem to be excited about their rigidity. We had soft sleves for our keycards that were constantly breaking. The only reason I did not give 5 stars is because I have not used them enough to know how well they will last. The down side is that it is hard to get a keycard back out of it but at least they won't fall out. These are the only badge holders that stand up to our busy environment. This is a great badge holder. Simple yet works very well. If they would last longer it would get all five stars. 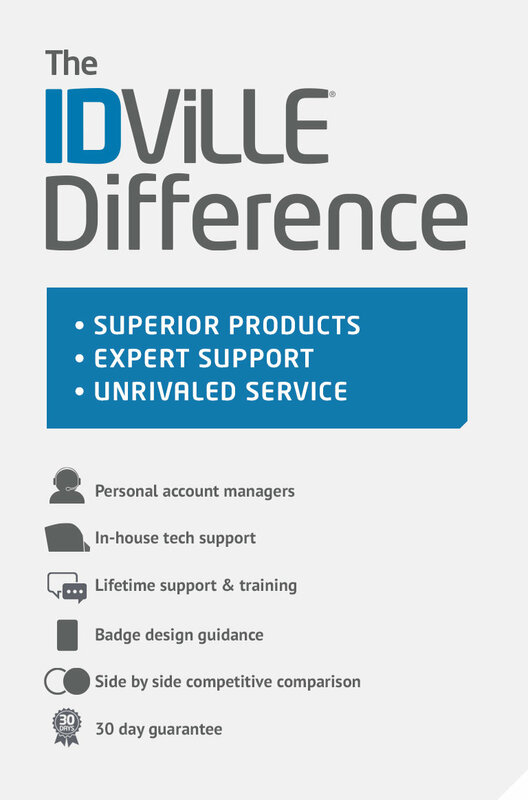 We only purchase badge holders from Idville. No other company has as durable badge holders. Hard plastic badge holders hold up better in our manufacturing environment,ID cards are dry and don't fall out, and very easy to wipe down and keep clean. This is a great alternative to having to replace badges. Easy to put the badge in and looks great all of the time. Very easy to read and view the badge. Great product! My company started using these badge holders to replace the plastic flimsy ones we were using. Would definitely recommend them if you are looking for something durable. We are using the badge holders for sports bag ID's and the hard plastic will hold up really well...after playing as hard as the sports members using them. We were happy with the thumb hole on the back side to aid in replacing the ID. If we were to say something to improve it, maybe a smaller thumb hole...doesn't need to be quite so large. We're hooked on a look! The ID's look very professional and all our convention guests were very pleased with them. The hardshell cover hold 2 ID cards securely. Protects HID cards from normal wear and tear. Holder may break when caught in car door but the HID card remains undamaged! Card is easily removed if needed. Card holders used for ID badges on a school campus. Holder protects badge while still allowing it to be scanned without removing badge from badge holder. We keep these in stock! We use these to protect our building access cards. In addition, we put a key ring on the badge holder for our necessary work keys. The holder is very sturdy, especially compared to others we have used in the past. We use these to protect our badges in the office & production environments. They work great & are easy to use. Good guard for Prox Cards. The rear tabs, which hold the card in place, need to last a little longer. Otherwise, great product. They are great! We love them! They were recommended to us. Was looking for a product to protect our badges. This product works perfectly. The hard shell protects the badge when it is in someone's pocket. The badge locks in place and does not slide out. We were getting replacement badges at a rate of 3 a week prior to purchasing the badge holder. We have not had a damaged badge since purchasing this product. This is a greadt product for my drivers who use cards to enter into our system. This product is used for id badges for the city fire and ems department. The product is perfect for the fair wear and tear of everyday use. The plastic badge holder keeps the card in place allows for visual identification without distortion no delays communicating with proximity card readers no condensation issues and no bleeding or ink transfer to the holder. My organization was searching for a hard case to protect our proximity badges from being bent. These cases met our needs, however they were not exactly what we expexted. We had hope the badges would be more secure in the case and would not be able to be jarred loose from the case. Hopefully IDville will redesign this product to better secure the ID. Our schools use these badge holders every day all day long. We've used other holders but they break quickly or don't hold the badge securely. We won't order anything else but this product from IDVille. We haven't been disappointed. Over the last 8 years, we've tried all sorts of ID badge holders and they've all fallen apart under regular use, except for this one. Pros: It's tough, doesn't appear to warp in Texas summer heat. Cons: A bit heavy, if you wear it near shirt buttons the sound of the holder scrapping the buttons may be irritating, does scratch, must destroy the holder to remove the contents. The only problem with this product we have had two in a box of 50 that the pinch to hold the card was not working. Durable; keeps ID badges from being damaged One major negative: after a bit of time, the pressure that keeps the badge from sliding out diminishes!!!! So, to prevent badges from sliding out, I proactively tape (clear packing tape)the badge inside the holder. Please research and correct this fault! Good protection, however, does not last very long. Tabs wear out, allowing badge to fall out. Helps with having the badges last longer. The badge holders were exactly what we needed!! Purchased this holder for the 1st time. It was issued to several employees (on/about 10-2014). No negative feed back as of the delivery of this review. Preferred the color green (school colors) but it was not available. I bought these holders to protect our badges, but they have no flex in them at all which makes them fairly easy to break under pressure. Otherwise they do work well to protect the badges. This product helped with protecting ID cards allowing them to last longer. We had an issue with our badges being folded over as people sat down. Once they are folded over the tiny wires break and they won't work. These badges kept them from breaking. The only issue I've seen is at the top were you hook the holder to a lanyard or retractable the plastic is thinner and if struck will break. Great protection for your security badge. We use it for our college ID cards. They can be scanned without removing the card. The hard plastic doesn't stick to the card and melt like the vinyl or other products the id department uses. It's easy to slide out but it will NOT fall out! So far no negatives. Great for protecting ID badges. This is far and inbetween the best badge holder on the market. We like the hard plastic case, which helps to secure the badge in place. It also prevents the badge from bending or breaking when sitting, bending or just from normal wear and tear. Great price, too! Thank you. We wouldn't buy any other product. In an organization that goes through 600 badges a year we need a durable product that does not allow badges to get damaged or lost. These holders when used with the clips deliver that protection while providing an easy to and comfortable way for employees to wear them. The vertical hard plastic badge holders are outstanding. They are the perfect gift for employees, as they last for year. No more plastic holders that we have to replace every month or so. This is the best product. We have a few staff that complained it cracks easily where you connect the clip. The rest of our staff love them. Depends on the user. I have had great success with these holders. They are very durable and easy to use.